What is Wake Forest Innovations? Susan Appt, DVM, investigates the influences of diet and reproductive hormones on chronic diseases affecting postmenopausal women, such as cardiovascular disease. She partners with industry to investigate and test therapeutics in nonhuman primate populations to improve drugs that prevent or treat diseases and manages the Preclinical Translational Services surgical technical team that supports industry and faculty collaborations. After earning her veterinary degree from Atlantic Veterinary College at the University of Prince Edward Island, Susan Appt, DVM, completed a large animal veterinary internship at the Virginia-Maryland Regional College of Veterinary Medicine in 1995. 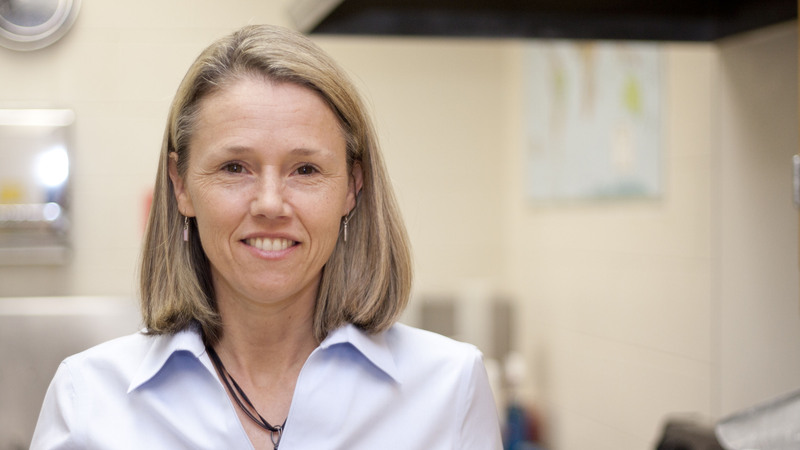 She spent seven years in clinical practice as a large animal veterinarian before completing a research fellowship in comparative medicine at Wake Forest School of Medicine, where she joined the faculty in 2004. Appt conducts preclinical research using nonhuman primates to explore the effects of nutrition and reproductive hormones on chronic diseases during perimenopause and postmenopause. She developed a nonhuman primate model of reduced ovarian reserve to examine the risk factors for women during the transition from the premenopausal phase to the postmenopausal phase, particularly the effects of the transition on cardiovascular disease. Appt’s research interests also include testing novel therapeutic agents, studying the effects of obesity on reproduction and investigating metabolic disease and bone loss. New research directions include exploration of the nonhuman primate model for investigations of the effects of diet and atherosclerosis on brain histologic markers associated with dementia. As scientific director of the Diet Laboratory, Susan Appt oversees the creation of custom-made, semi-purified diets used in preclinical research to study the effects of nutrition on disease. She assists investigators in developing diets tailored to meet their particular research needs. In her capacity as associate director of Preclinical Translational Services, Appt assists with the management and coordination of the surgical technical team of Preclinical Translational Services and facilitates interactions among faculty, researchers, human resources and various laboratories. Appt works with her industry partners to design investigator-initiated studies and conduct contract research studies. These studies include investigating and testing therapeutics in nonhuman primate populations to improve drugs that prevent or treat diseases like atherosclerosis. Explore more about Wake Forest Innovations and how we partner with you to improve health. Discover the high-caliber investigative technical, clinical and surgical services available through our preclinical research team, lead by experienced veterinary professionals with specialized experience in large animal models. Access unique research animal models through Wake Forest Innovations, including a world-class nonhuman primate center and other large animal research models. Partner with Wake Forest Innovations to access leading diabetes, metabolic disorders and obesity research solutions for your clinical or preclinical needs. Our experts can help take your cardiovascular research from bench to bedside, from cross-departmental preclinical research on therapeutics, medical devices and tissue-engineering to clinical trials developing diagnostic techniques, preventative measures and interventions. Explore the latest technologies and techniques that are at your fingertips through the technical services available from Wake Forest Innovations to support your preclinical study. Associate surgical research veterinarian in Preclinical Translational Services, DeLoid provides preclinical surgical services for medical device and diagnostics companies. Improving health through collaborative innovation between industry and the faculty and staff of Wake Forest Baptist Medical Center.